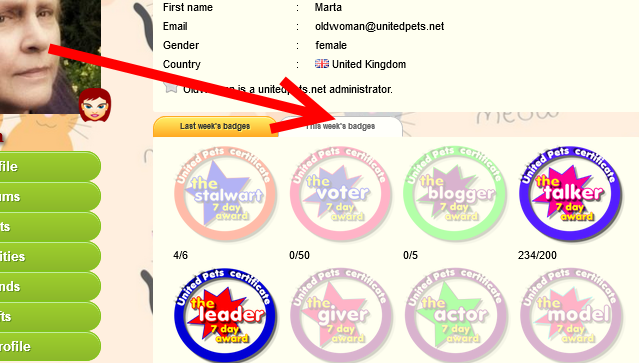 Certains activities on the site are rewarded by badges, which are displayed on your user profile page. Each badge represents a specific activity such as signing in every day, writing a blog, commenting, starting a new forum topic, giving gifts, making a video, uploading photos, welcoming new users, patting pets and playing with them. If you hold your mouse over a badge, it will show you which activity the badge represents. . Your activities are counted for a week and then at midnight on Sunday West European time badges are awarded for activities in which you have reached the required minimum level. The counters are then reset ready for the following week. As you carry out your activities, your progress toward each badge can be seen if you click the tab "This week's badges". The requirements for each badge and your progress towards it are shown below each badge. For example 1/200 means that you need to carry out the activity 200 times in order to get the badge, but have done the activity so far only once. Badges for which you have already reached the required minimum level are shown normally, whereas the badges which you have not achieved yet are shown faded out. If you have worked very hard and obtained at least 7 badges, you will additionally be awarded a gold cup. This will be displayed on your user avatar.